47k Ohm Resistors - 10pcs - Metal Film - 1/4 watt - 1% - 47k - Ships Today! cruize has no other items for sale. 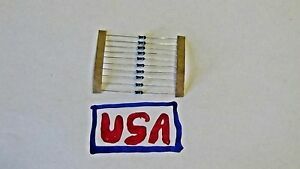 Details about 10k Ohm Metal Film Resistors - 10pcs - 1/4 watt - 1% - 10k - Ships Today! Wonderful! Great packing and great item! Great seller - Smooth transaction - Prompt delivery - Will definitely buy again!